Since the start of his presidency, a big question has been whether or not Donald Trump would ever make a presidential pivot, leaving scorched-earth "Campaign Trump" behind for a new, more unifying style of leadership moving forward. The answer we've gotten time and time again throughout the past two years is no, a presidential pivot is not happening. If there's one thing Donald Trump has been consistent about since he rode down an escalator to announce his candidacy, it's that there's no Mr. Nice Guy hiding away somewhere. He is who he is, like it or not. And no, despite his recent State of the Union address being his best and most unifying speech to date, that is not a signal he's changing his ways. But what if he had pivoted and done what he said he's capable of doing, be "with the exception of the late, great Abraham Lincoln...more presidential than any president that's ever held this office"? Would he have had more success over the past two years? Would his approval rating be sitting higher than the 40% he's generally at? Would he have, at times, received bipartisan praise as opposed to the constant onslaught he's been hit with from the anti-Trump resistance? To find the answer to these fascinating questions one need look no further than Florida, where a Trump acolyte running for governor won and then made a unifying pivot that nobody saw coming. 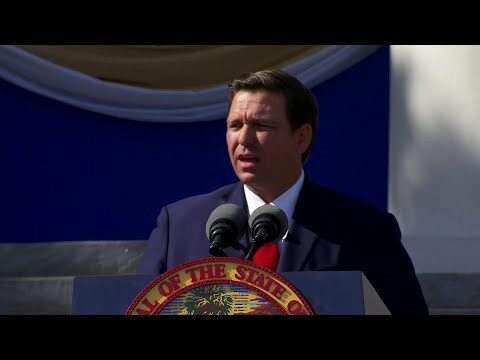 When the cult-like nature of this campaign ad made national news, it was hard to imagine we'd one day see a Governor DeSantis receiving bipartisan praise on numerous occasions for actions taken early in his tenure. Yet that's exactly what has happened in one of the most surprising political stories of the new year. While Ron DeSantis ran a gubernatorial campaign that was similar in style and tone to that of Donald Trump's 2016 presidential campaign, his governing style couldn't be more opposite to that of President Trump's. From legitimate efforts to reach across the aisle to policy proposals that both Republicans and Democrats could get behind, DeSantis has managed to do in his first few weeks what Trump has failed to do for over two years. There's a positivity in Florida politics that hasn't been seen in quite some time, which has led to substantial momentum for the new governor. DeSantis could have taken office and went after those who played hardball against him during the 2018 campaign. He could have started off by focusing on divisive issues that are much harder to reach a compromise on. He could have used rhetoric during the recount and in his inaugural address that played up an us vs. them narrative. Instead, he stayed calm and quiet during the recount and made immediate overtures to his opponents after officially winning the race. He's focused on issues and policies that have the opportunity to widen his base, as opposed to simply playing to the cheap seats where red meat is the only thing anybody has an appetite for. The result? About as good of a start to a governorship as anyone in the country has had so far. While we don't have any official approval ratings to point to just yet, anyone with even a hint of common sense understands that DeSantis is likely far above the 40% range President Trump usually finds himself in. Now, is this level of success and bipartisan praise sustainable? Probably not. When the legislative session starts and the real game begins, challenges will mount for the new governor and some people won't like his decisions. However, he'll be starting from a position of strength with quite a bit of goodwill in the bank, which can be helpful during difficult negotiations. So for those of you who love the president's style and have dismissed the idea of a presidential pivot as being necessary or helpful, take a look at Governor DeSantis and the success he's having. That could have been President Trump too, not only making America great again but bringing us together at the same time.